Perhaps one of the most overlooked aspects of visiting Disney is the variation in weather throughout the day. Yes, it's fairly well known that there WILL be thunderstorms in the afternoon during the summertime, but I have a feeling few casual tourists expect various temperature fluctuations in a day at Walt Disney World. This past Friday (Good Friday, to be exact) was a perfect example of what a spring day can be like weather-wise here in Florida. I checked the weather forecast and saw that the temperature at rope drop for Epcot was scheduled to be 71 and overcast. The forecast high was 80. My plan of action was clear: jeans in the morning and a change of shorts for the afternoon. One of the perks of being a local is driving to the parks, and therefor being able to take necessities along and access them as needed. 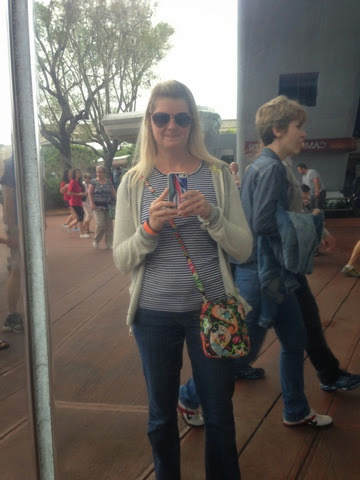 I planned to drive to the Magic Kingdom later in the day, so I started off in jeans, a fitted t-shirt, a light zip up hoodie and flip-flops (always flip-flops for me). After completing the egg hunt around World Showcase and checking out Festival Center, it was time to head over to the Magic Kingdom. 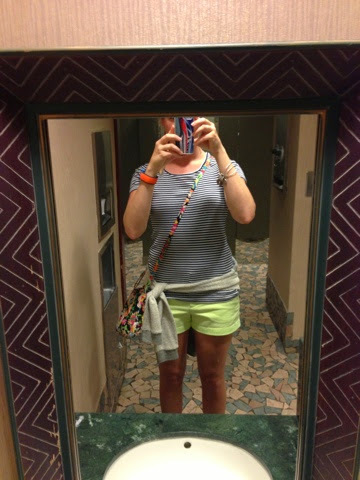 I had a FastPass+ for the 3:00 Festival of Fantasy parade, so I headed to the car and changed into a pair of shorts. I parked at the TTC and took the monorail to the Poly. I heard they had started construction on the atrium lobby, but thankfully, all was well and still in place. (I posted a picture of the lobby on my Instagram). After stopping in the Grand Floridian to see the chocolate painted Easter eggs, I headed to MK for the parade. It was my first time seeing it, and I liked the FastPass+ viewing area. I'm not one to really watch the parades, fireworks, or stage shows, let alone camp out hours before hand to get a good spot, so this was ideal for me. I was in and out of the Magic Kingdom in an hour and a half, just in time to get stuck on a tram to the parking lot as the skies opened up and poured for a half an hour or so. The kicker-- this North Face rain jacket was sitting in my car. That's it for this one. Up next, Friday night cocktails at the Grand Floridian. Thanks for reading!